An invitation to the launch event of what looked like a very worthy endeavour linked to showcasing the skills of apprentices at the Early Bird Bakery (which as per usual – mid week rarely works for me – I regrettable couldn’t make) bought to my attention their Friday night showcases, with the added benefit of BYO booze. 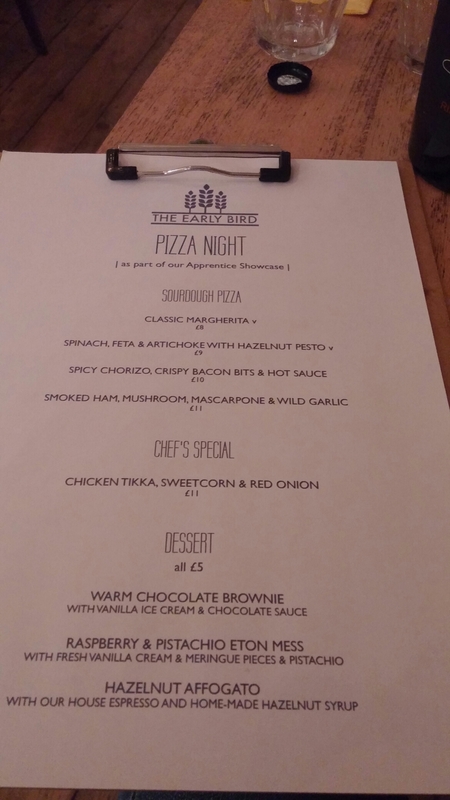 The apprentice showcased this November is Kaylem, with an offering each Friday in November of his sourdough based pizza creations. I immediately booked as I love a good pizza and absolutely love one that comes with a free corkage BYO policy. Allows me to rummage though the wine room (or a wine shop) which is one of my favourite ways to while away an hour or so. I also think apprenticeships (earning while your learning) are an excellent thing. We even have them in the legal profession these days (a route I would perhaps had taken if it was available back in the quill and ink days when I started out). 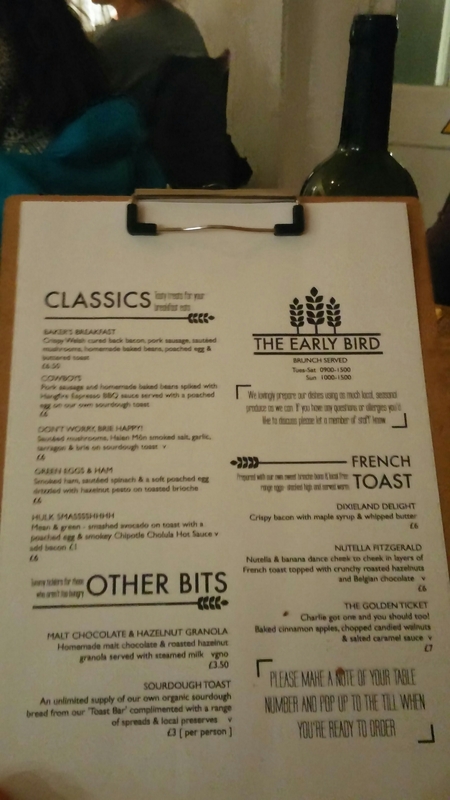 Situated in the heart of Cardiff’s studentville, it is a café by day, with a very nice looking breakfast/ bunch menu (love some of the names). and a good selection of cakes etc. It was buzzing on our visit with a predominately twenty something crowd (Mrs. SF and I single handedly increased the average age median, quite significantly). I had a rather privileged seat which allowed me to look directly into the kitchen. 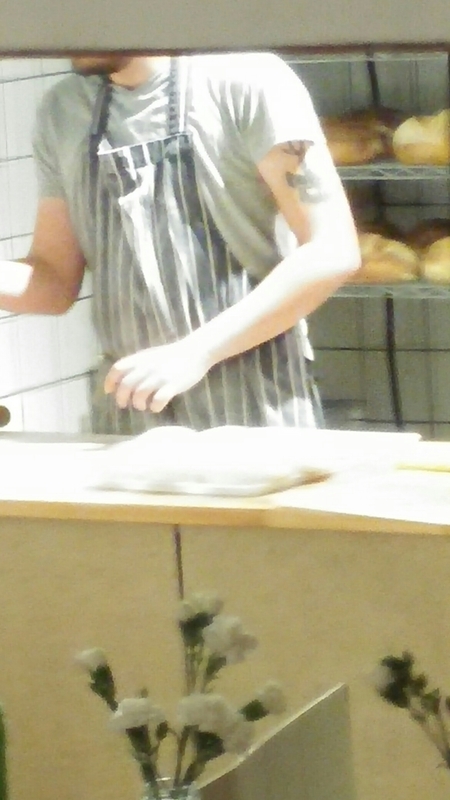 Love watching chefs at work (am a nosey bugger). 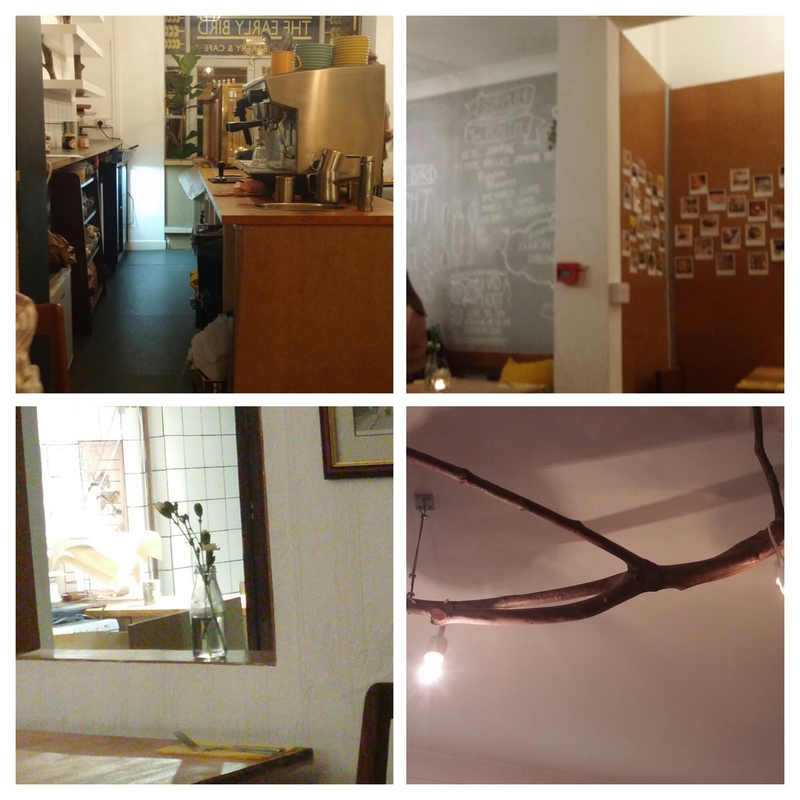 The place had a nice relaxed informality to it, which I rather liked. As it was pizza night, the menu of course was all about that fast food par excellence and it featured some rather inventive numbers on the topping front, all sitting on sourdough bases. Whilst both Mrs.SF and I were tempted by the non meat offerings (hazelnut pesto sounded fab, with spinach, artichoke and feta), we are avowed meat eaters (and that combo, especially the artichokes, is hellishly tricky to match wine wise and would have clashed horribly with wine I had brought – sherry would be the best bet pairing wise). I am also too much of a traditionalist (on the pizza front) to countenance ordering the chicken tikka special, so was left with a choice of the two meat based options. Mrs. SF’s. 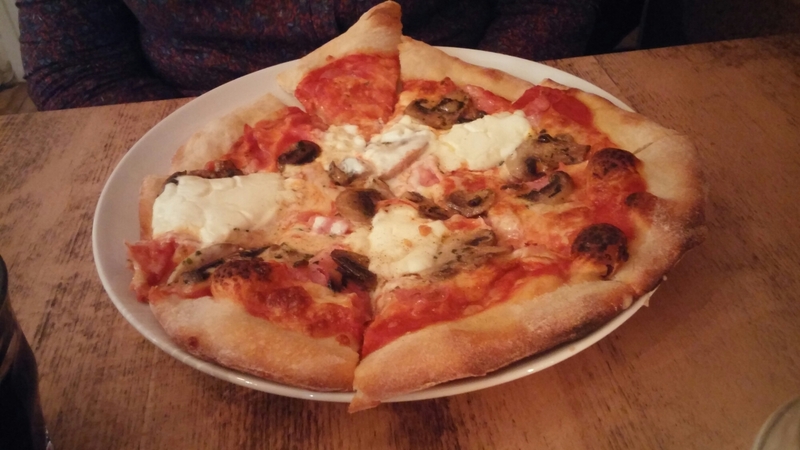 (beating me to the punch) went for the smoked ham, mushroom, mascapone and wild garlic number (£11) which was full of flavour, having a rather lovely garlic creaminess to it from the mascapone and wild garlic. 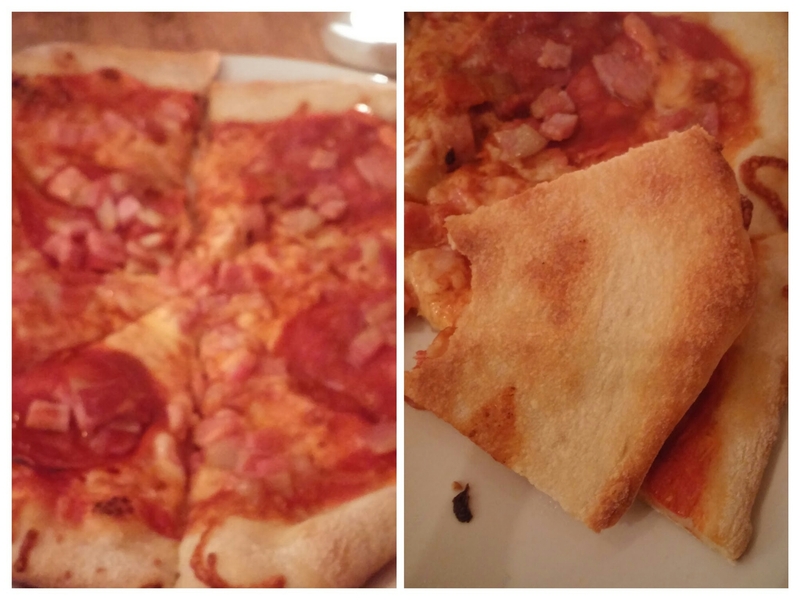 My chorizo, bacon and hot sauce pizza (£10) was, perhaps less of a looker, but still jam packed full of flavour. Nicely spiced chorizo, crispy quality bacon bits (not many things are better) and a pleasing piquancy (rather than incendiary heat) to the sauce made for a happy me. Both pizzas hit the nail on the head in terms of the all important base. Beautifully crisp (but not too much so) on the outside, with a pleasing chew. Kudos to Kaylem for creating these banging bases. 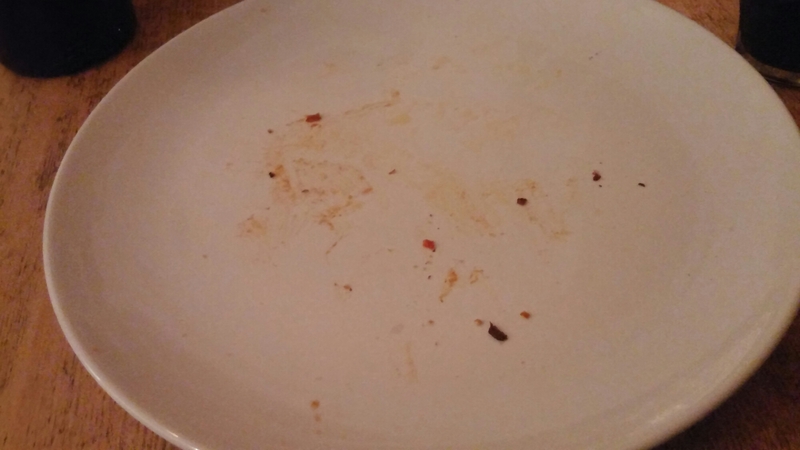 Another plus point for an old fogey like me was my pizza coming (praise the Lord) on a plate. Hugely underrated things plates in the restaurant world. 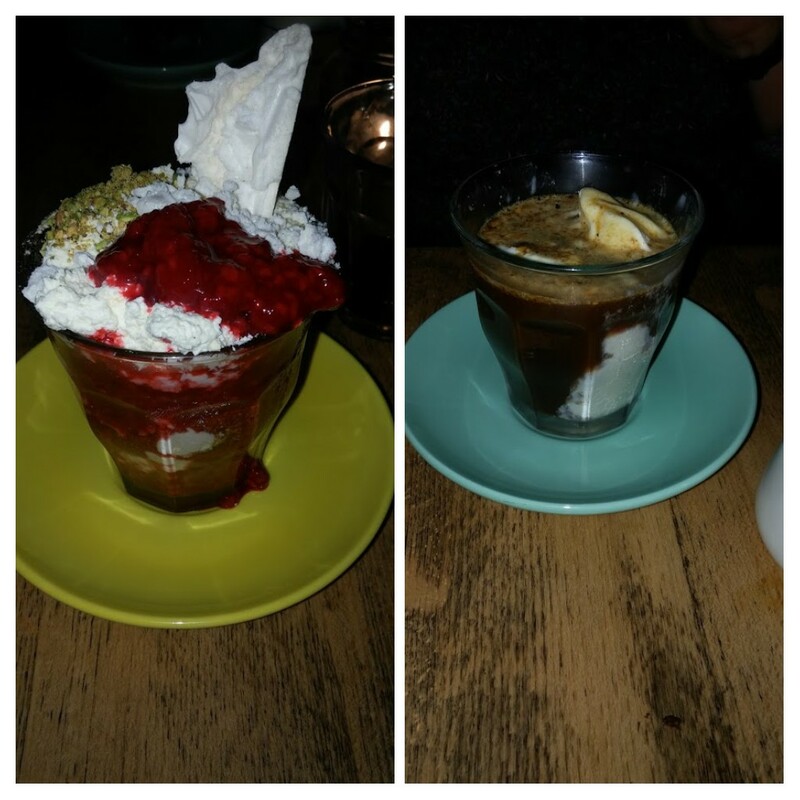 On the puds front (all a fiver), there was a short but rather nice sounding selection. I went for Eton Mess with pistachios and raspberries.The slightly tart puréed raspberries worked well as a counterpoint to the sweet chewy meringue and rich cream. The nuts added both favour and texture to the mix. Mrs. SF went for the affogato (vanilla ice cream with hazelnut syrup and an espresso poured on to it), which she thoroughly enjoyed. 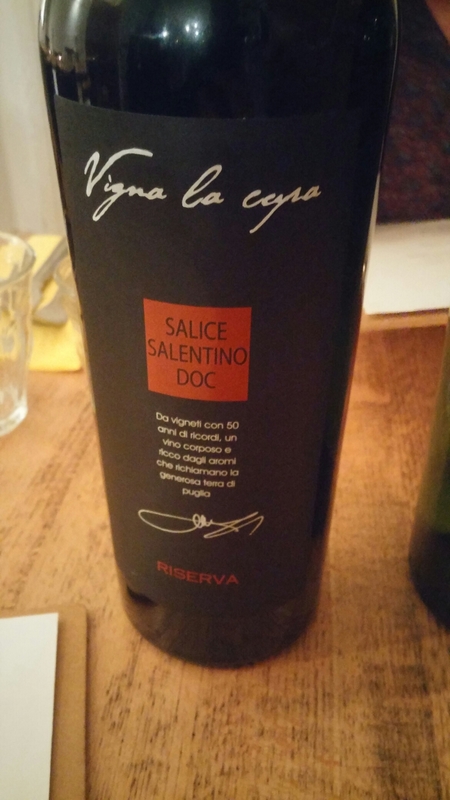 On the booze front (as mentioned earlier), joy of joys it is BYO (God I love that) and in keeping with the pizza theme, I brought with me an Italian number from Puglia in the form of a Salice Salentino wine (£12.25). I got this from the rather lovely Al Ponte in Pontcanna (a superior, newly opened, deli/butcher/wine shop, ticks so many of my boxes that combo – if you haven’t been pop in as they have a cracking selection of stuff). The wine had red berries and touch of smoke on the nose and palate and a slight bitter (in a good way) backnote, which worked very well with our highly flavoured pizzas. 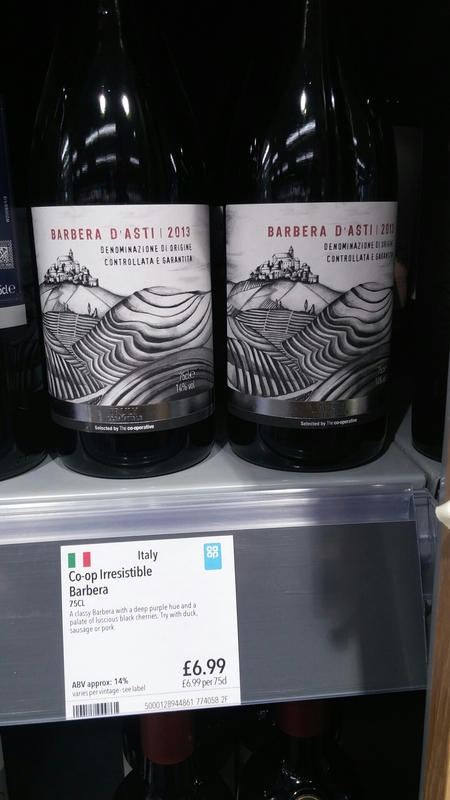 like this one from the Co-op. 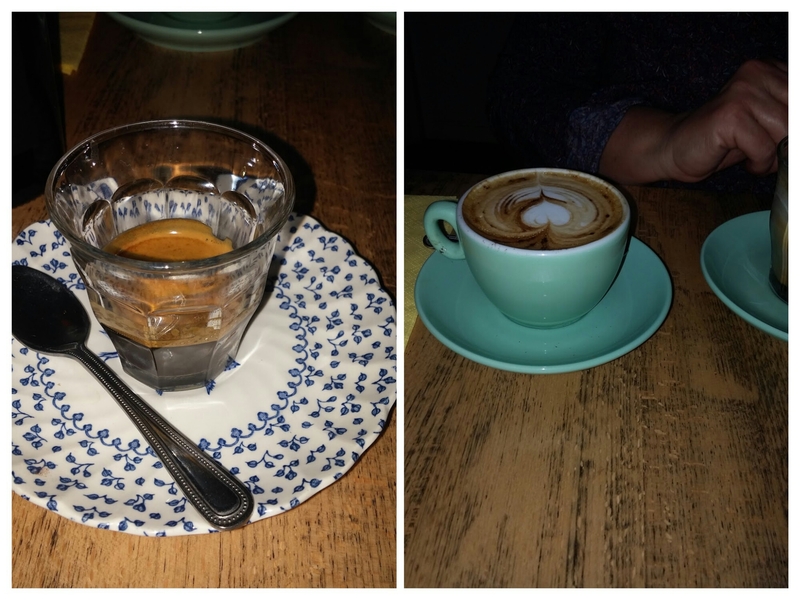 Proceeding were finished off with a good espresso (£2) and a cappuccino (£2.40). 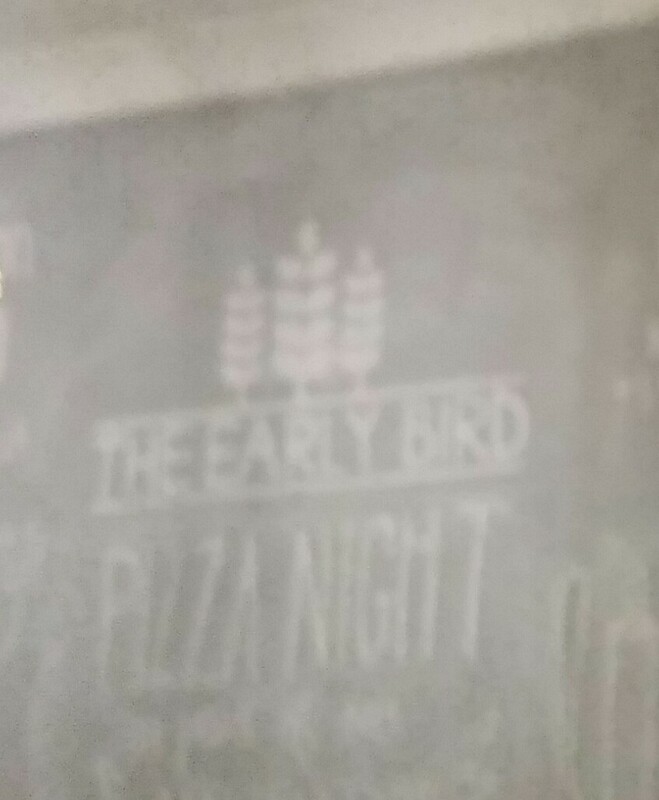 Mrs. SF and I thoroughly enjoyed our visit to one of the Early Bird Bakery’s showcase pizza nights. Food was great and so was the very pleasant service (really nice people). Price wise we paid just over £35 (sans a well deserved tip). 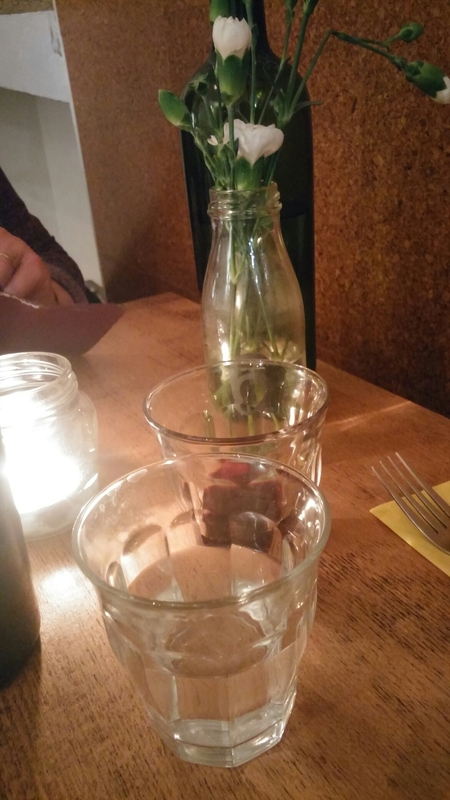 A nice touch was a couple of brownie cubes with the bill. Very gooey, as a good brownie should be. I thought the price we paid very fair for what we got. I think they have unearthed a real gem of a pizza maker in Kaylem and personally believe it would be a crying shame if they didn’t make this Friday pizza night permanent post the end of November. Keep it going, pretty please! In any event you still have the remaining Friday nights in November to take advantage. My advice is do so (booking essential). Would I go back? If given the chance (i.e. they keep it going), definitely. Brunch also looks rather tempting. 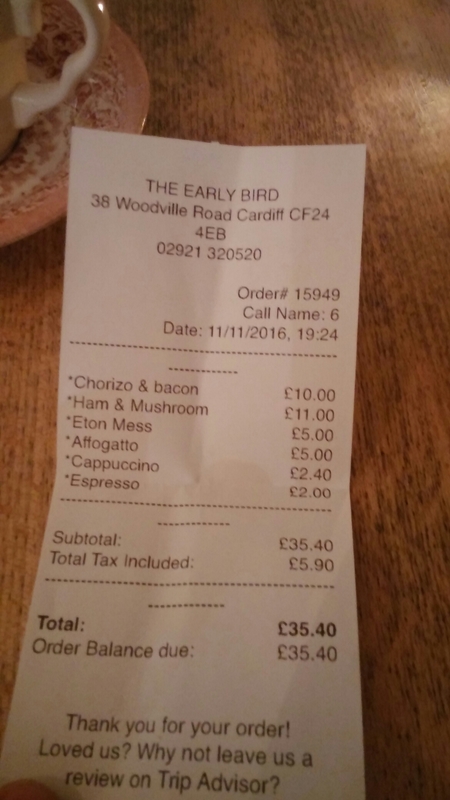 This entry was posted on Nov 13, 2016 by solicitingflavours in Al Ponte, Alcoholic drink, Bacon, bistro, Breakfast, BYO, Cafe, cake, Cardiff, Cardiff restaurant, Cathays, coffee, corkage, Drink, Fast food, Food, Food and wine products, Ice cream, Italian wine, Italy, No corkage, Non alcoholic drink, pizza, pop up, Restaurant Review, review, Sourdough based pizza, The Early Bird Bakery, Wales, wine, wine pairing.